"For all sorts of expression media including musical instruments, overt and covert rules of identification for media like "This is such a media", it limits ability of expression on the media and user himself. If you could reject or destroy the rules, you would see the universe of infinite beauty out there. Brothers and sisters, discard rules and fly away to the universe of infinite beauty!" 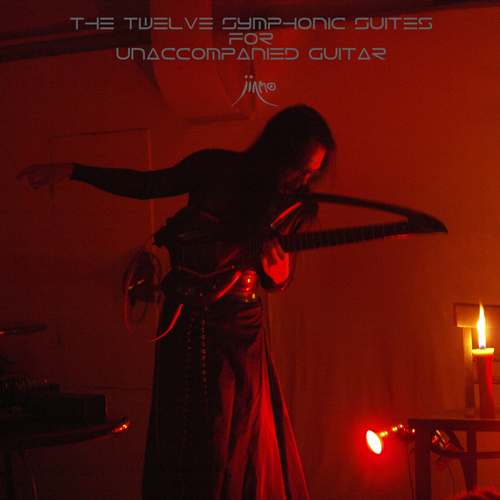 "The Twelve Symphonic Suites for Unaccompanied Guitar", it is like a symphony, it is like a rhythmical contemporary music, or it is like Sci-Fi spectrum soundtrack. However it is unaccompanied guitar solo by JINMO as the title suggests. this is a collection of unaccompanied guitar solo. Many people would be surprised that it is unaccompanied guitar solo, but some fans who had experienced JINMO's show (especially the fans who experienced recent shows "Burnt Offerings" at "Bullet's" in Roppongi), they would appreciate that the sounds are exactly as JINMO plays in his shows. Eros and Thanatos, these two opposites are intertwined as one like DNA double helix and it is the same with the experience you would be in "Burnt offerings". JINMO often says "No borders between live and dead", we would find what he means with listening to this album. It is the first release of unaccompanied guitar album in 14 months since the release of his "Eternal Moonbeam On Elysium" that released in February 2010. Large numbers of voices pan on various periods and move as you would be experienced in JINMO's solo show "Burnt Offerings", it is the one of the important elements in this album. So we recommend to listen with headphones for higher listening experience.